[139 Pages Report] The global downstream processing market is poised to reach USD 22.03 Billion by 2021 from USD 10.32 Billion in 2016, at a CAGR of 16.4% from 2016 to 2021. Based on technique, the market is segmented into purification, solid-liquid separation, and clarification/concentration. In 2016, the purification segment accounted for the largest share of the market. This high growth is attributed to the need for highly pure biopharmaceutical products to meet the regulatory standards, as downstream purification plays a significant role in enhancing the purity and quality of products aiding the growth of the purification market. Based on application, the downstream processing market is categorized into monoclonal antibody (mAbs) production, vaccine production, insulin production, immunoglobulin production, erythropoietin production, and other applications. In 2016, the vaccine production segment accounted for the largest share of the market. Technological advancement in the downstream purification technology to develop high-quality products such as vaccines at lower costs is expected to drive the growth of this segment. Based on end user, the market is segmented into biopharmaceutical manufacturers and contract manufacturing organizations (CMOs). In 2016, the biopharmaceutical manufacturers segment accounted for the largest share of the market. The increasing demand for biopharmaceuticals among the aging population is expected to accelerate the growth of the biopharmaceutical manufacturers’ end-user segment. This research report categorizes the downstream processing market on the basis of technique, product, application, end user, and region. 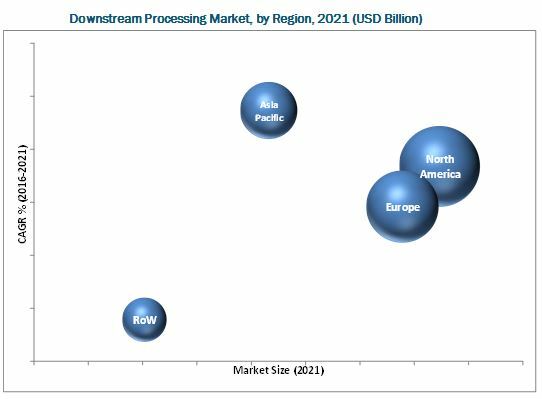 The global downstream processing market is projected to reach USD 22.03 Billion by 2021 from USD 10.32 Billion in 2016, at a CAGR of 16.4% from 2016 to 2021. In this report, the global market is broadly segmented on the basis of technique, product, application, end user, and region. Major factors driving the growth of the market are increasing R&D expenditure in the biopharmaceutical industry and increasing demand for biopharmaceuticals. However, the need for skilled professionals and the high cost of instruments are expected to restrain the growth of this market. On the other hand, patent expiration of blockbuster biopharmaceutical products represents significant growth opportunities for the key players in the market. On the basis of product, the market is broadly classified into chromatography columns and resins, membrane adsorbers, single-use products, filters, and other products (consumables and accessories). The chromatography columns and resins segment is expected to grow at the highest CAGR during the forecast period. This growth can be attributed to the constant need for newer and different types of columns and resins. On the basis of technique, the downstream processing market is segmented into purification, solid-liquid separation, and clarification/concentration. In 2016, the purification segment accounted for the largest share of the market. This high growth is attributed to the need for highly pure biopharmaceutical products to meet the regulatory standards, as downstream purification plays a significant role in enhancing the purity and quality of products aiding the growth of the purification market. The Asia-Pacific region is expected to grow at the highest CAGR during the forecast period. Countries like China, Japan, India, and South Korea, are expected to drive the demand for downstream processing products in the coming years. Also, growth in these markets will be fueled by significant investments by key market players, increasing government support, developing R&D infrastructure, and growing expertise and academic excellence. North America is the world’s largest pharmaceutical market and a leader in biopharmaceutical research. North America (comprising the U.S. and Canada) accounted for the largest share of the global market in 2016. Rising quality requirements have emphasized the need for advanced bioproduction technology in this region. 12.4 Sartorius Stedim Biotech S.A.